In the first part of my article we looked at the Old General, real name Benjamin Mayo, and we looked at his character and some of the famous tales about him. 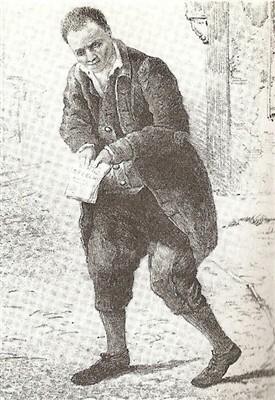 Ben spent the later years of his life as a great well known local character in Nottingham. He was simple minded but well loved by everyone. He lived with his mother for most of his life and when she died he was taken in by a Mr Hudson of St Peter’s Poorhouse. When Mr Hudson left Nottingham, Ben went to St. Mary's Workhouse. The Old General did not settle here. After a time he had a fall, from the effects of which he died and he was buried in the old St Peter’s Churchyard, Broad Marsh burial ground. 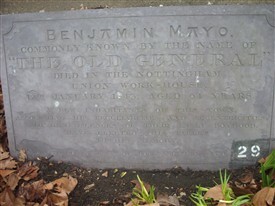 BENJAMIN MAYO COMMONLY KNOWN BY THE NAME OF "THE OLD GENERAL" DIED IN THE NOTTINGHAM UNION WORK-HOUSE 12TH JANUARY 1843, AGED 64 YEARS. A FEW INHABITANTS OF THIS TOWN, ASSOCIATING HIS PECULIARITIES AND ECCENTRICITIES,WITH REMINISCENCES OF THEIR EARLY BOYHOOD, HAVE ERECTED THIS TABLET TO HIS MEMORY. I recently visited the General Cemetery and went to visit the Old General’s plaque which is located in a quiet corner of the cemetery. To my shock the plaque was in quite a bad state. I found it to be covered in leaves, litter and it has for a while now been propped against the wall on the floor. The plaque originally was mounted on the wall above but due to decay had to be placed on the ground. I had to clear leaves and litter from the plaque so I could read and photograph it. It is sad to see the plaque in such a state and I think it should be reinstated on the wall, before it becomes either damaged or lost. I’m sure a lot of people can remember the ‘Old General’ in one way or another, most people have memories, perhaps of drinking in the pub or hearing from their parents or grandparents about this eccentric character. 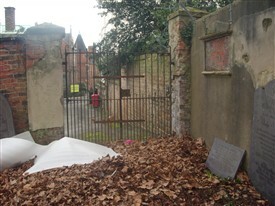 It would not cost much to reinstate the plaque back on the wall and to organise a little memorial. Perhaps some of the local history societies would be interested in preserving the plaque and passing on the memory of The Old General to the next generation of Nottingham? Article by The New Nottingham Hidden History Team. This page was added by Joseph Earp on 16/06/2012.